Where do you start when you didn’t know that there was an ending? Ashley was a healthy, vibrant, and fun loving 27-year-old with her whole life still ahead of her. She was born December 28, 1982, graduated from Romulus Sr. High in 2001, attended the University of Michigan and then graduated from Henry Ford Community College with a degree in Accounting. She was married in 2007, had recently received a promotion at work, had purchased a new home in Trenton, Michigan and was planning to start a family. October 12, 2010 was a normal day for everyone. Ashley woke up and went to work; she was a Branch Manager and Assistant Vice President at PNC Bank in Michigan. After work she called me, her sister, Leslie, and we chatted for a while, then we ended our call with “I love you, Chop! Talk to you later.” Chop was a nickname that we called each other. Ashley arrived at our mother’s house and changed clothes. They had dinner and then they went to church. 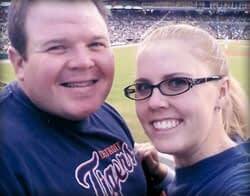 They had driven to church separately because afterward Ashley was heading to her home. The meeting ended, Ashley and Mom each drove to the gas station that was just down the road and filled their tanks. They hugged and said their good-byes and each promised to text when they got home. Around 11:45pm Jason, her husband, arrived home from work and went into the bedroom to let Ashley know that he was home, but she was unresponsive. He turned the light on and saw that she was not breathing, called 911 and started CPR. The ambulance arrived on site and took over the attempts at resuscitating her. Once Ashley arrived at the hospital, the emergency room doctor pronounced her dead at 12:25am on Wednesday, October 13, 2010. The reason at that time was undetermined. The Medical Examiner found her cause of death to be myocarditis, a disease none of us had heard of. Myocarditis took her from us—our wife, our daughter, our sister, our aunt, our niece, and our friend. Her life suddenly ended just as it was beginning.